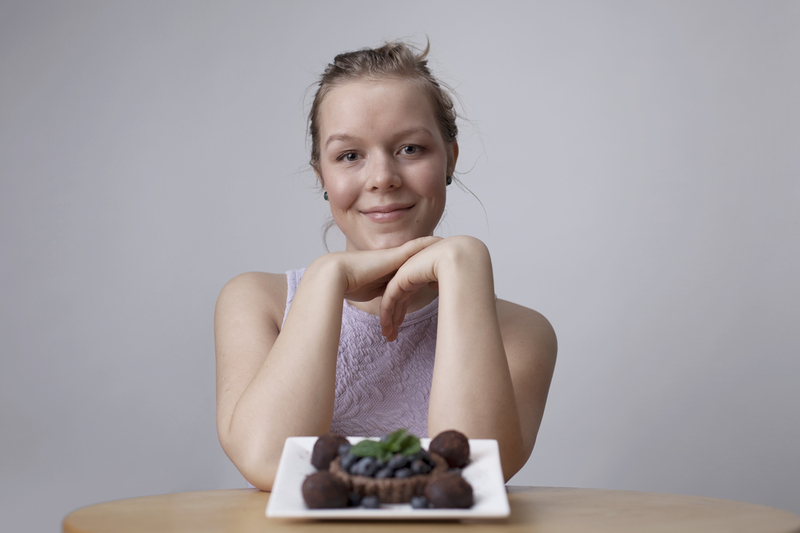 Today we welcome Emily von Euw, creator of the popular food blog This Rawsome Vegan Life and author of Rawsome Vegan Baking. 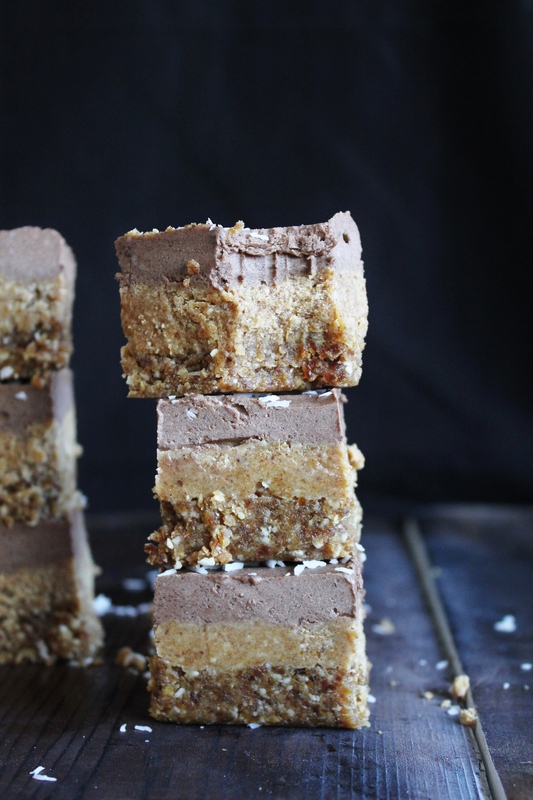 WARNING – CHOCOLATE LOVERS – Impossible-to-resist recipe for Ultimate Caramel Chocolate Squares inside! Hi! I’m Emily von Euw. I am the creator of This Rawsome Vegan Life and am the author of Rawsome Vegan Baking, a raw vegan desserts cookbook with about 100 recipes and full page color photos. I wrote Rawsome Vegan Baking in four months, over the summer, and loved every minute, though that was a lot of desserts to make in such a short amount of time! On average, I was making one recipe per day and photographing it on top of that. Luckily I have a lot of hungry friends. 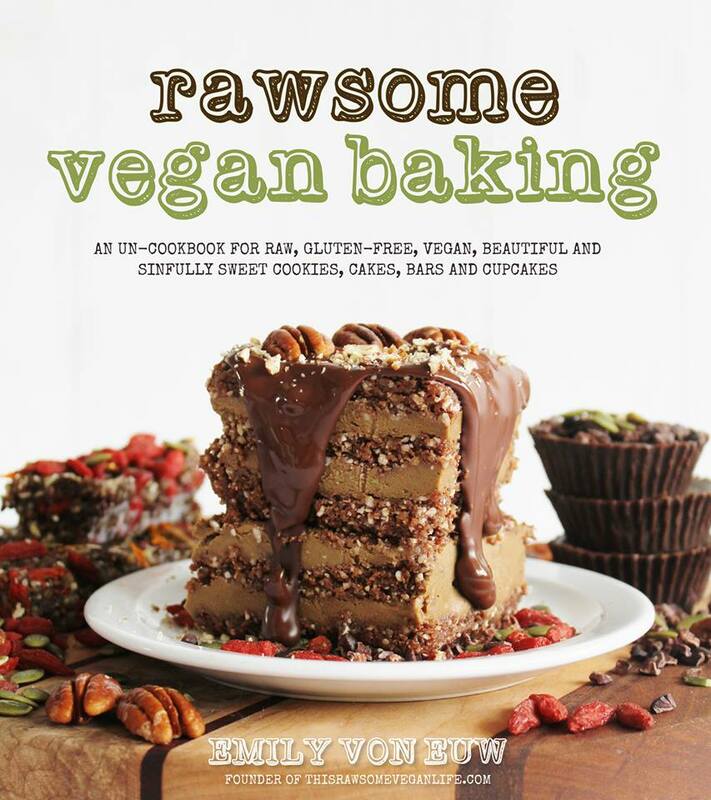 I designed Rawsome Vegan Baking to be accessible for every kind of person and eater. The recipes are easy, delicious and super good for you, the planet, and our animal pals. There are about 100 recipes and each one has a full-page color photo to go with it, because personally, I think food is so much about appearance; it’s a visual thing. There are chapters focused on pantry lists, equipment and techniques for raw food making, as well as chapters all about cakes & cupcakes, cookies & bars, pies & tarts, and ice cream & pudding! Wow yourself and your friends (or enemies…) with these wholesome, healthy treats that can mostly be made in minutes. I think a lot of people assume that raw foodist don’t enjoy a wide variety of foods or that all they eat are carrot sticks and alfalfa sprouts. #1: this is sooooo false. Raw foodism is one of the most flavorful and diverse diets you can choose to follow! It opens up your entire world of taste with fresh, vibrant, new ingredients. But #2: although there’s a lot of amazing raw food dessert recipes out there, I felt like there was a niche that had yet to be filled. There were a heck of a lot of raw vegan brownie recipes and not much else. I wanted to expand the horizons of raw vegan treats. Since I have a huge sweet tooth (which, at the suggestion of family and friends, is what started my blog in the first place), I seem to be able to get pretty creative when it comes to dessert. I fashioned my desserts into the raw vegan variety and voila! Niche found. People seem to love what I have to offer and my blog became popular enough that my publisher found me and approached me about a book based around desserts. One year later and the book is on shelves across the globe! 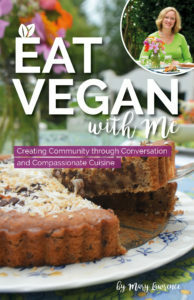 I’m so excited to share these recipes with people, and do my part to make the world a yummier and more compassionate place. Currently, I am writing my second book, which will be all about juices and smoothies. My website, This Rawsome Vegan Life, is a food blog where I create, photograph and share raw vegan recipes with the world. It has been running for about three years, and I’ve been vegan for four (I went vegan overnight when I was 16). I actively try to make my blog open to everyone – I don’t care what your diet is, I just want you to do what works for you and makes you happy. My recipes are easy, quick, healthy, cruelty-free, eco-friendly and delicious – everybody wins! When I’m not whippin’ up banana chocolate mylkshakes or kale chips, I can be found jamming to records, devouring dates with peanut butter, hugging animals and trees, dreaming about baby pigs, studying archaeology (this semester anyway), and laughing spontaneously because the world is one beautiful place! In the future I’d like to build my own house on a trailer bed (sounds sketchy but it will be awesome) and drive around the continent eating all the fruits I find, with a piggy companion at my side. These are way better than any packaged chocolate bar I’ve ever had, not only because they really do taste better but also because they are made only with wholesome ingredients and love! This is another great recipe to share with those who doubt that “healthy” and “indulgent” can be included in the same dish – chocolate always wins ’em over. To make the base layer: pulse the dates, salt and flour together until a rough dough forms. Press into the bottom of a lined 9X9 baking pan and put in the fridge. To make the caramel layer: blend all the ingredients until smooth, and then spread onto the crust. Then do this for the chocolate layer too, and spread it over the caramel layer. Let it sit in the fridge overnight and then slice and serve the next day. So good. 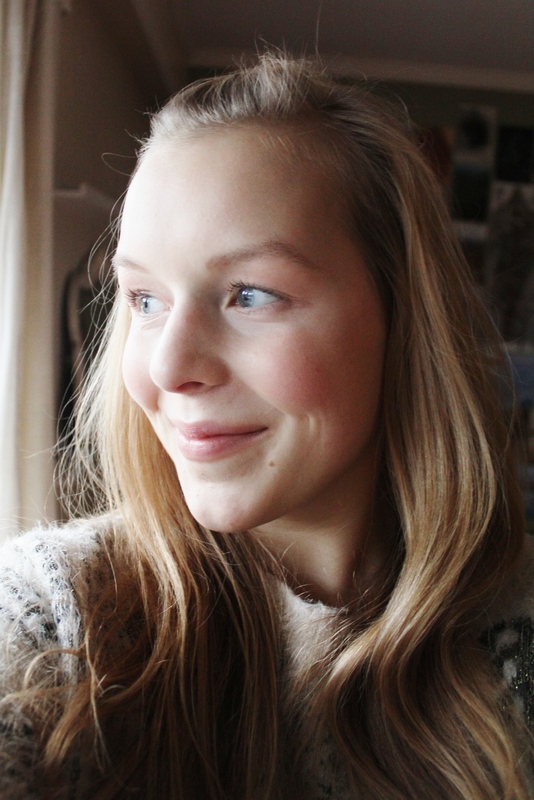 Emily von Euw is 20 years old and lives in beautiful British Columbia, Canada with her parents, cats and brothers while attending university. She is currently working on her second book which will be all about smoothies and juices. Emily is absolutely beautiful! She just glows :) Every recipe of hers I’ve ever seen is beautiful as well! Love the blog & will definitely be on the search for the cookbook! I’m a new person interested in baking and cooking healthier. I’ve been carrying around 80 extra pounds had 5 children and it’s been 20 yrs now. So excited to learn a much healthier way to eat.